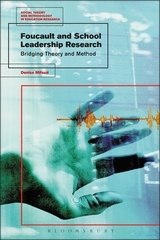 Foucault and School Leadership Research illustrates the application of Foucauldian theory to an educational leadership research context, thus staging the ways a researcher negotiates the methodological tensions and contradictions in the conduct of qualitative inquiry within education research. The book draws on an empirical study of a multi-site school collaborative that investigates relations of power within the unfolding network among the various leadership hierarchies in school governance. The book is anchored around a narrative dramatization that the author, Denise Mifsud, crafts from her data, using the dramatic play as a medium to present her research findings so as to show rather than just tell readers about network leadership dynamics. Mifsud’s innovative use of dramatization to communicate her findings and analysis serves to problematize the representation of qualitative research, as well as to incorporate researcher interpretation and explicate the intertwining nature of theory and methodology. Through the use of Foucauldian theory, mainly his notions of webs of power, discipline, governmentality, discourse, and subjectification, the research narrative critiques and problematizes traditional understandings of educational leadership. The book focuses on and demonstrates the challenging enterprise of the art of theory application in method by outlining the epistemological, operational and analytical challenges encountered: the application of Foucauldian concepts in education research contexts; the adaptation of methodological and theoretical concerns; in addition to showing how the quality of research outcomes is shaped by social theory. 10. Bringing Down the Curtain?